Our acclaimed �Meeting History� education project uses �living history� techniques to bring students face to face with characters from history, providing an enjoyable, informative and memorable insight into periods covered by the National Curriculum. 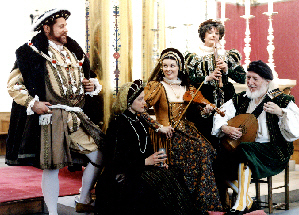 Using interactive �first person� performances the students (most suitable for ages 8 to 13) are able to meet personalities such as Henry VIII, Elizabeth I, Sir Walter Raleigh, Charles I, George IV, Charles Dickens, and many others. All characters are portrayed as honestly as is possible including known mannerisms and traits. The students are encouraged to discuss with them issues of the day, such as Henry VIII�s �great matter�, or Victorian social concerns. They get to see and touch ephemera and costumes of past ages, and ask about eating, etiquette, sport and fashions. The lives and concerns of the common folk can also be re-created, be they workers during the Industrial Revolution or Londoners trying to carry on regardless of the Blitz. History, science and entertainment can be combined in our Victorian Magic Lantern demonstrations. These performances are suitable for schools, museums and historic venues which run educational projects. See further web page for information on our award winning �Hatfield House, Living History Education Project�.